Trump Expects North Korea to Honor Pledge on Missile Tests - Integration Through Media ....! 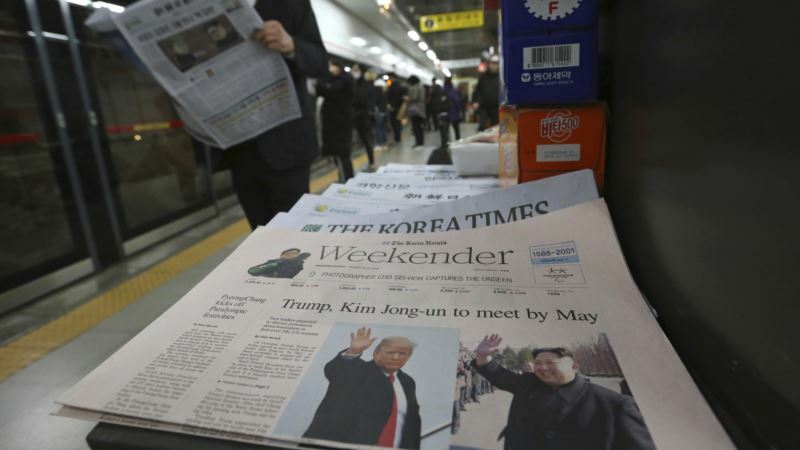 (VOA): U.S. President Donald Trump expressed faith Saturday that North Korea would keep its promise to halt missile tests, days after his surprise acceptance of North Korean leader Kim Jong Un's invitation to discuss Pyongyang's nuclear program. The president tweeted: It was not immediately clear whether the president was referring to his planned meeting with Kim or other meetings. Trump said earlier Saturday that he had spoken with the leaders of China and Japan about his acceptance of Kim's invitation and that they were supportive of his unprecedented diplomatic mission. The White House announced Thursday that Trump had accepted Kim's invitation, which was delivered to him verbally that day by visiting South Korean officials. The move revived hopes that a nearly decadelong diplomatic stalemate between the U.S. and North Korea could be broken. But ​Trump faces complex, unresolved issues, according to former U.S. officials and analysts who have dealt with North Korea extensively. Ken Gause, director of the International Affairs Group at the Center for Naval Analyses, welcomed the announcement, calling it "extraordinary and historical." Alexander Vershbow, who served as the U.S. ambassador to Seoul during the George W. Bush administration, said the acceptance of the invitation was "the right thing for President Trump to do." The invitation to meet by May established a time frame that raised concern among some analysts in Washington. "I am concerned by President Trump's response to the invitation that he meet with Kim Jong Un — not that he agreed to meet, but that he agreed to meet by May," said Robert Einhorn, a special adviser for nonproliferation and arms control in former President Barack Obama's administration. Einhorn said he thought Trump should have agreed to lower-level exploratory talks that "could test North Korea's seriousness." A senior Trump administration official defended the president's decision, however, arguing previous lower-level talks had failed. Some experts cautioned against overoptimism about the prospects for a breakthrough, questioning the North's sincerity toward denuclearization. "I fear Trump is walking onto a North Korea trap," said Robert Manning, a senior fellow at the Atlantic Council. "A summit should be at the end of a process of denuclearization, not be based on good faith that Kim will actually denuclearize." U.S. Secretary of State Rex Tillerson, who is on the other side of the world on a weeklong Africa tour, said Friday that Trump's decision had come from Trump himself, and he downplayed any suggestion that the State Department was blindsided by the announcement. Trump's decision to talk with Kim came as no surprise to top U.S. military officials, though they were wary of setting any expectations. The Pentagon said Friday that Defense Secretary Jim Mattis had been in contact with the White House and involved in the decision to accept the North Korean leader's offer. As part of the agreement to meet, Kim agreed that routine U.S.-South Korea military drills would continue as scheduled next month. The North usually protests the drills, which Pyongyang views as preparations for an invasion. Despite that apparent concession, there were questions as to whether the sanctions targeting the North had made enough of an impact on its government to make Kim want to start negotiations in earnest. "Obviously, we're cautiously optimistic that there is some forward progress here," Mattis told reporters earlier this week, following a meeting with Estonia's defense minister at the Pentagon. "But we've been optimistic before, so we're going to have to watch actions and see if they match words," he said. The White House on Friday emphasized that the United States had made "zero concessions" in agreeing to the talks. White House press secretary Sarah Huckabee Sanders said, "The president will not have the meeting without seeing concrete steps and concrete actions" by Pyongyang regarding its promises to stop nuclear and missile testing It was not clear what Kim will want in exchange for abandoning a nuclear weapons program that has been a focus since he became supreme leader in late 2011. Jeff Prescott, a senior national security aide to former President Obama, told VOA on Friday that the Trump administration must do all it can to turn this potential opening into an opportunity to advance U.S. interests, not Kim's. "That objective has been made all the more difficult because this administration confronts today's news with one hand tied behind its back," Prescott said. "We have no ambassador in Seoul — not even a nominee —and no senior State Department official charged with overseeing the North Korean nuclear challenge."